Port Sudan (Arabic: بور سودان‎ Būr Sūdān) is a port city in eastern Sudan, and the capital of the state of Red Sea. As of 2007[update], it has 489,725 residents. 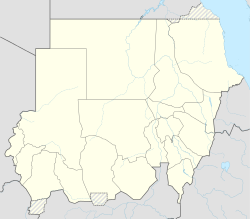 Located on the Red Sea, it is the Republic of Sudan's main port city. Port Sudan was built in 1905 to replace Sawākin (Suakin). An oil pipeline was between the port and Khartoum in 1977. The city has an oil refinery and handles the majority of the country's international trade. Major exports include oilseed, senna, and hides and skins. Imports include construction materials, heavy machinery, and vehicles. The city has a modern container-port to handle imports and exports. The main airport is Port Sudan New International Airport. There is now a tarred road linking Port Sudan to Khartoum via Atbara. Port Sudan also has a rail link with Khartoum. There is also a international ferry from Jeddah. The city is home to the Red Sea University, established in 1994. Port Sudan has a hot desert climate (Köppen: BWh) with extremely hot summers and moderately hot winters, requiring the acquisition of fresh water from Wadi Arba'at in the Red Sea Hills and from salt-evaporating pans. Temperatures can easily exceed 30 °C (86 °F) in winter and 45 °C (113 °F) in summer. Over 90% of the annual rainfall falls between October and January, mostly in November, with the wettest month on record being November 1947 with 182 millimetres (7.2 in), whilst the wettest year was from July 1923 to June 1924 with 231 millimetres (9.1 in). Average annual rainfall is 76 millimetres (3.0 in), and no rainfall occurred between January 1983 and June 1984. The average temperature is 28.4 °C (83.1 °F). The population consists mainly of Arabs, with small Asian and European minorities. ^ a b c "Port Sudan | Facts". Encyclopedia Britannica. Retrieved 2018-11-02. ^ "Red Sea University". African Studies Center. Archived from the original on 2011-08-12. Retrieved 2011-09-17. ^ "Port Sudan Climate Normals 1961–1990". National Oceanic and Atmospheric Administration. Retrieved January 24, 2015. ^ "Climatological Information for Port Sudan, Sudan". Hong Kong Observatory. ^ "Station Port Soudan" (in French). Meteo Climat. Retrieved 22 October 2016. ^ "Port Sudan | Facts". Encyclopedia Britannica. Retrieved 2018-11-02. Arckell, A. J., UNESCO General History of Africa, History of Darfur 1200-1700 A.D. SNR.